Vancouver Island Dogs Rescue Society hasn't added a story. On Easter weekend Vancouver Island Dogs Rescue Society received a call about a very sick pup on the North Island-- He needed help immediately. Thomas entered into our care and was immediately taken to the vet. He had 20% of the fur left on his sore body due to the severe Demodex mange that had ravaged his skin. Open sores were oozing all over, his vision was poor due to infection, even his nose and ears were feeling the itch and burn of the bacterial infections that riddled his sickly body. On top of the infections parasites were all through his digestive system, he was dehydrated, and he was very underweight. Basically-- We were told he would have had two-three weeks left to live. It has been one month today since we received this sick boy. 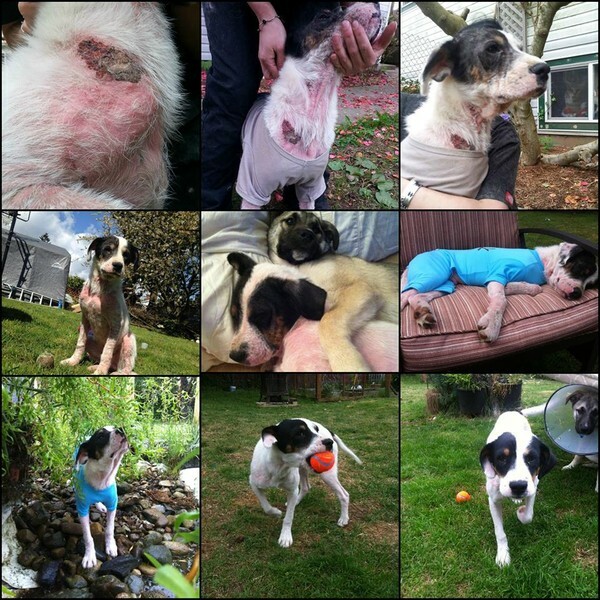 It has been one month of love and care from his amazing foster mom; one month of scrubs in the bath with the incredible Kimberley Matalas "Feel Better" pet products, and one month of the incredible veterinary care and attention that he has received from Chase River Veterinary Hospital in Nanaimo. It is because of the incredible donations of time, products and support that we are happy to introduce you to: Little Thomas! Though he is much happier-- and well on his way to recovery-- the first weeks were no walk in the park. Thomas was in a lot of discomfort and due to his suppressed immune system he was forced to live in an isolated world. Even though he's made it over many hurdles it will be many months before he is strong enough to even receive any shots. He will continue to have medicated baths every other day as his skin heals--- His amount he has already progressed has stunned out veterinarian and we must say that much of it was thanks to Shauna for providing thehttp://m.kimberlymatalas.com/PRODUCTS.html that are healing him up. Though his first month with us as been one of discomfort--- Through it all he has been a young dog with a very loving personality. He is his foster mom's shadow, happy and content to have his ball thrown to play fetch, and a total cuddle bum!!! After the first few weeks of isolation he also now has energy to burn playing with his foster brothers and sisters. The VERY pregnant Marshie was brought to us with the intention of having her spayed and vetted after she safely delivered her litter of puppies. She was taken for prenatal check-ups and everything seemed to be on track. That was when we received the phone call from Marshie's caretaker: The pregnancy wasn't going well. Six beautiful and healthy puppies had been born-- followed by the unfortunate loss of two of their siblings. To add to that, something wasn't right with mom--In fact, something was very wrong. Marshmallow was promptly taken to the vet where she was rushed into an emergency spay surgery. She was carrying 11 large puppies in total-- but only 6 of the puppies had made it. It was just far too many puppies for her small frame and fragile immune system. Had Marshmallow not been brought in for her pregnancy, mom and all 11 babies would not have survived. There would not have been the sufficient vetting available to save mom-- and the 6 living puppies would have had to have made it without the loving Marshmallow to care for them-- making their chances very minimal. Today— We are happy to share that Marshie and her pups are all doing wonderfully! Help us with Thomas and Marshie so we can continue to help others just like them! As you can well imagine the cost of vet treatment is very high for dogs like Thomas & Marshie. The community of Vancouver Island has been generous. Affiliated Bosley's Stores help with providing the goods needed to feed, stimulate, and manage the well being of these dogs. Generous individuals donate toys and bedding . Every little bit is a huge help for our organization and is put to great use! In order to allow us to continue taking on cases like Thomas-- please donate. We use the funds to help with veterinary care. As always, EVERYTHING we receive goes straight to the dogs! We are 100% volunteer. 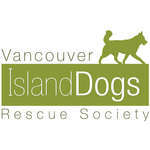 Vancouver Island Dogs Rescue Society hasn't posted any updates yet. Vancouver Island Dogs Rescue Society is managing the funds for this campaign.